From critically acclaimed and nationally bestselling author Laura Kasischke comes a new novel that is part Stephen King, part Donna Tartt, and wholly unputdownable. The accident was tragic, yes. Bloody and horrific and claiming the life of a beautiful young sorority girl. Nicole was a straight-A student from a small town. Sweet-tempered, all-American, a former Girl Scout, and a virgin. But it was an accident. And that was last year. It's fall again, a new semester, a fresh start. Craig, who has not been charged with murder, is focusing on his classes, and also on avoiding Nicole's sorority sisters, who seem to blame him for her death even though the police did not. Perry, Craig's roommate, is working through his own grief (he grew up with Nicole, after all, and had known her since kindergarten) by auditing Professor Polson's sociology class: Death, Dying, and the Undead. Mira has been so busy with her babies -- two of them, twins, the most perfect boys you could imagine but still a nearly impossible amount of work even with Clark's help -- that she can barely keep herself together to teach (Death, Dying and the Undead), let alone write the book she'll need to publish for tenure. And Shelly, who was the first person at the scene of the accident, has given up calling the newspapers to tell them that, despite the ''lake of blood'' in which they keep reporting the victim was found, the girl Shelly saw that night was not bloody, and not dead. Laura Kasischke's The Raising is a remarkably haunting book of love and suspicion; murder and mystery. Taking place at a college in Michigan, the story follows the lives of several teachers and students who have all been drawn together by the horrible death of Nicole, a straight-A, honor roll student. The general consensus is that Craig, her boyfriend, murdered her. Yet, Shelly, the first person at the scene of the accident that killed Nicole, claims that Nicole was still alive and that Craig was trying to help her. Perry, Craig's roommate, may know more about Nicole than he's willing to admit. In trying to deal with the grief that he feels around Nicole's death (they had been friends for years), he takes a class about death and inadvertently draws that professor, Mira Polson, into the intrigue surrounding Nicole's death. And why do people on campus still think they see Nicole wandering the school? Is is a ghost they are seeing, or something else all together? Kasischke has a remarkable talent for drawing amazing detail out of what seems like a dream. Her writing can be very ethereal at times, but it never leaves the reader questioning what her meaning is, and in the case of The Raising, her writing style fits the emotion of the book perfectly. Imagine, knowing that something happened to the girl you love, and you think that you had something to do with, but you're really not sure and you can't remember and all you know is that now she's dead, and people blame you. I think I'd be walking around in a state of shock all the time. Kasischke really creates that sense of unbalance in Craig's life, as he's trying to piece together his life, while still trying to come to terms with what happened to Nicole. 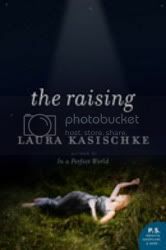 If you've never read anything by Laura Kasischke before, Id highly recommend The Raising. It's a deceptively powerful story that will linger with far after you've finished reading it. Ghosts of reviews past, or I'm going on vacation!